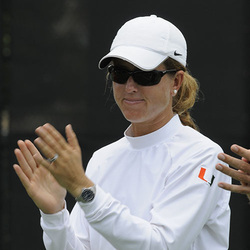 Paige Yaroshuk Tews is the Miami women's tennis program winningest coach, with a 202-61 overall match record (.768), coming into the 2012 season. She has led the Hurricanes to the NCAA's "Elite Eight" in five of the last six seasons, and an NCAA berth in all her 10 seasons as head coach, and been named the ACC Coach of the Year 3 times. She has coached eight different players to a total of 17 All American honors, and helped Audra Cohen to an NCAA Singles National Championship in 2007. Laura Valverdu won the Honda Sports Award in 2010, given to the top female amateur tennis player in the country. Under her watch, four Miami players have garnered ACC Player of the Year honors since the school joined the conference in 2005, and both Cohen (2007) and Megan Bradley (2005) were named ITA National Player of the Year. The Canes have won at least 20 matches in 7 of her 8 previous seasons at the helm, and she has led them to eight straight Top 15 ITA finishes and four Top 10 finishes in the past six seasons. The 2006 Hurricanes went to the NCAA finals before falling to Stanford. A two-time All American in both singles and doubles in her senior year at UCLA, she was also an All-Pac 10 selection in singles and doubles. Prior to college, she was ranked #1 in Girls 18 division in the state of Florida while at Killian High School. Paige is the daughter of UMSHoF member Ernie Yaroshuk, a 1992 inductee for baseball, they become the first father-daughter duo to be enshrined. Married to Scott Tews, they have two children, Emma and Landon.